We had a tremendous month doing our work in Edinburgh. We had some amazing experiences. We saw some work from other performers that was inspiring and affirming. We got so much out of the opportunity to perform and run our show so many times in a row. We can’t overstate the value of that work. If we are honest, we also had some dips. It is a struggle to get an audience in a festival as competitive as the the Edinburgh Fringe. As expected we had to tell ourselves to keep our chins up a time or two, but overall this has been a tremendous success. We are reflecting on the year long job of producing a show at the Edinburgh Festival Fringe. Our budget got it’s final once over and we are pleased to say we balanced up nicely, all expenses covered, all collaborators paid for their work. We received some nice and thoughtful reviews of our work that we know will serve us as we continue our work on the show, and as affirmation of the work we have already done. We have gotten more as performers, and creators, and producers out of this year of work than we could ever express and it wouldn’t have been possible without you. 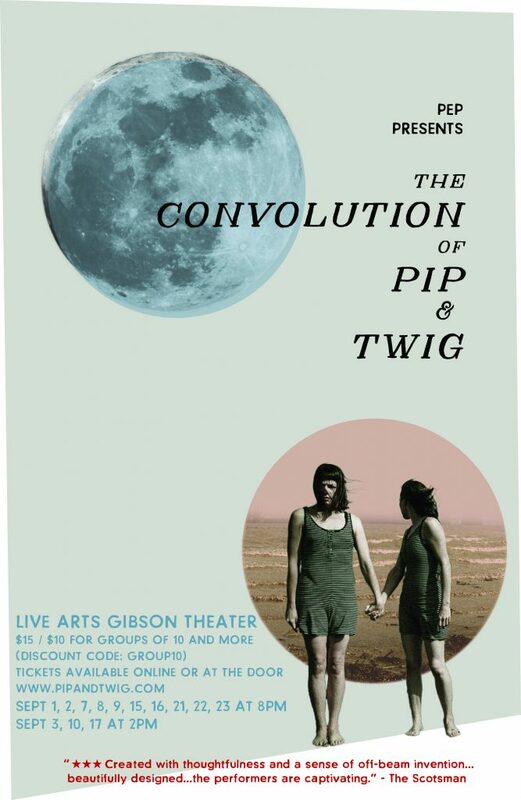 We will be re-working The Convolution of Pip and Twig using lessons and new inspirations from our run at the fringe and plan to perform the show again in Charlottesville in the fall of 2017.